Day 1 of Great Alaskan Road Trip at lunch stop. We left home Sunday morning, May 17th, at 4:30 in the morning. We avoided much of the heavy traffic and soon found ourselves on the hills of Pennsylvania. We had practiced towing the car on some hills in Connecticut, but knew the Pennsylvania hills would give us our first accurate assessment of how our Blue Ox tow set up would work. The camper has a Ford F53 Chassis and a 460 V10 engine. My Dad, brothers and nephews know much more about trucks than I do, and they had assured me that our new camper was a workhorse and would easily tow the Jeep. They were correct! The camper kept up with traffic easily as we travelled Route 80 through the Pennsylvania countryside. It remains to be seen how well it will tow in the Rockies, I’ll keep you posted. 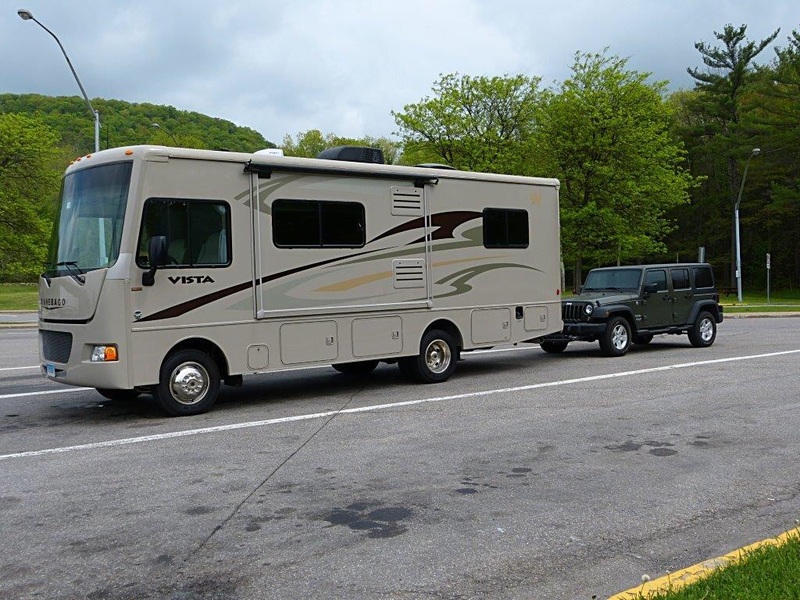 We stopped every two hours or so to let Woolly Bear stretch his legs, and ended our first day at the KOA in Mercer/ Grove City PA., near the Ohio border. Our second day of travel brought us to our first destination: Indiana Dunes National Lakeshore and a campsite at Indiana Dunes State Park. It feels good to be back on the road! We camped at site 93, a spacious site with lots of room for our chairs and screen house. $20 per night with electricity. 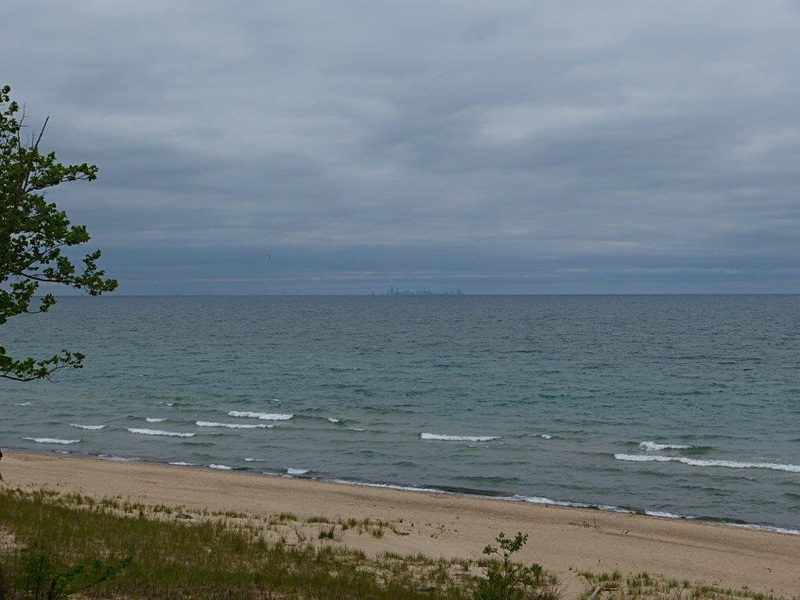 Our site is adjacent to the Nature Trail that leads to the shore of Lake Michigan. Woolly and I hiked the mile to the lake early this morning, and surprised a very healthy looking red fox coming down the trail. Of course, WB jumped into his protective mode, or his ” let me at the fox” mode, so I was too busy holding the dog back to get any pictures. 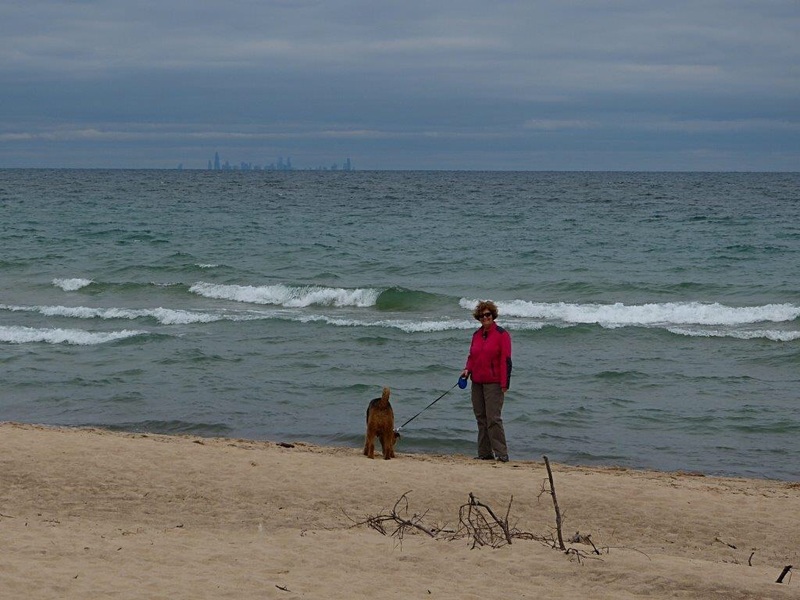 We brought Charlie on the trail to the lake later in the day, and once again had the entire beach to ourselves! Later on, we took the camper for a quick repair at Camp Land RV Center. The water tank fill lever had broken, and the service people at Camp Land were great, coming out to the rig and assessing the problem, then installing a replacement lever for the valve. 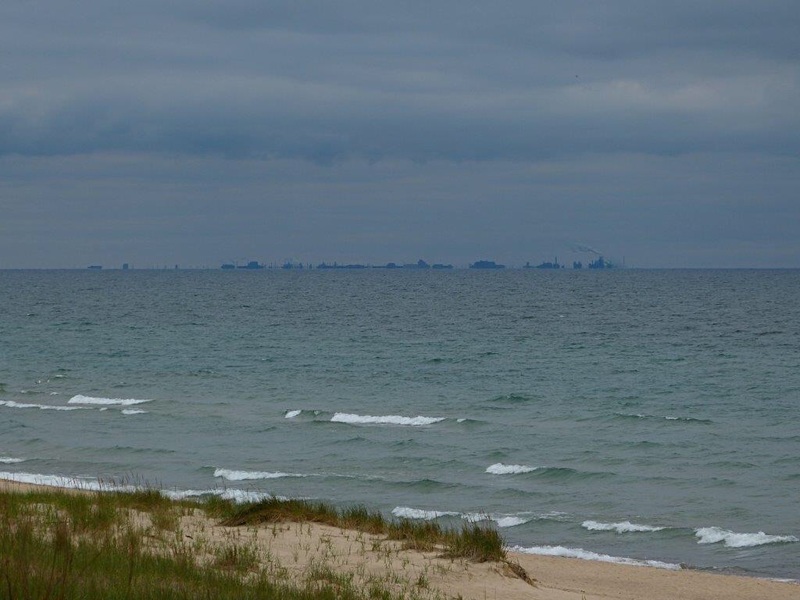 The Indiana Dunes National Lakeshore is a thirty mile stretch of lakeshore and sand dunes situated along Lake Michigan’s southern shore between Gary and Michigan City. According to the National Park brochure, the National Park Service was only a month old when its first director Stephen Mather tried to save the Indiana Dunes from development in 1916. World War 1 derailed that, and Indiana Dunes State Park was created in 1926. The National Seashore was not created until 1966, when the Port of Indiana was created as part of a compromise to save the natural sand dunes and the 15,000 acres now protected. Charlie and I had always just driven through Indiana on our way West, not knowing that such a beautiful place was minutes away from the congestion of Chicago. In addition to camping, hiking, and canoeing/kayaking, bird watching is huge in this area! The campground is very well kept and extremely dog friendly. Woolly Bear is allowed on all trails and beaches until swimming season starts on Memorial Day week end. But even then, there are many beach areas where dogs can run and swim. If you haven’t thought of Indiana as a destination, you might rethink that!!! It is simply magnificent here. 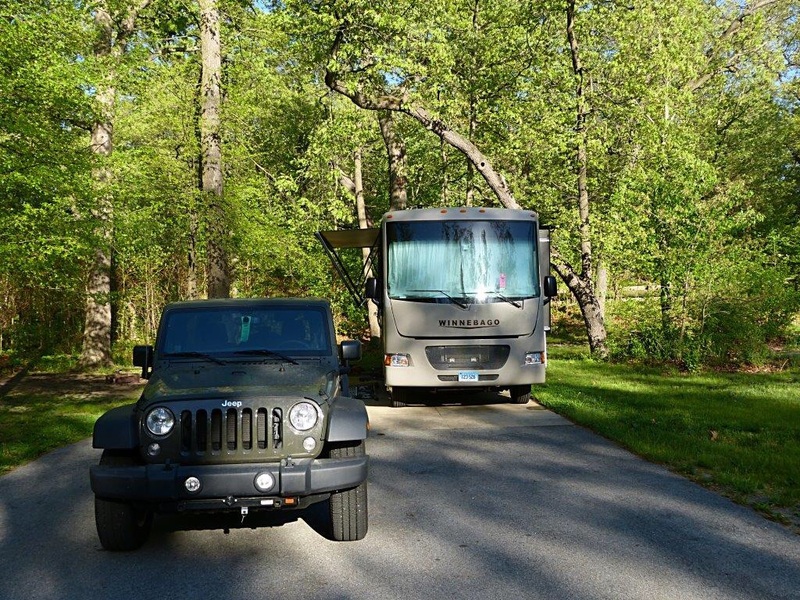 This entry was posted in Alaskan Road Trip, Indiana Dunes National Seashore on May 19, 2015 by Ramblin' Rose. WOW! Looks as though you are off to a wonderful new and welcomed adventure! ENJOY!! Thanks Liz. I hope you are making lots of fun plans for the summer! Di, email has been sent!!! Nice looking rig you have there! Enjoy your trip! Will look forward to your posts! Thanks Pam. It was a lot less expensive than our previous one, and a lot bigger as far as storage and living space. It doesn’t have all the bells and whistles the other did, but the real bed and the oven more than make up for that. I loved reading about your Pacific Coast trip, great photos!! !